GREENFIELD – The McClain Tigers hosted the Chillicothe Cavaliers on Friday at McClain High School for the second game of their Frontier Athletic Conference schedule and fell by a final score of 63-7. The Tigers started their first drive of the game on their own 20-yard line after the Chillicothe kickoff went into the end zone for a touchback. After being stopped on their first play the Tigers ran a counter to the left side with Dalton Mischal carrying the ball. Mischal made one defender and then another as he cut back across the field and stiff armed Chillicothe defender to break into space. From there it was a footrace as Mischal raced toward the touchdown with a host of Cavaliers trailing. Mischal crossed the goal line with 11:02 to play in the first quarter and kicker Braeden Bergstrom converted the point after to give the Tigers an early 7-0 lead. Chillicothe wasted little time answering and got an assist in the form a a 15-yard penalty against the Tigers that put the ball past midfield at the McClain 45. Five consecutive run plays by the Cavaliers with ball carriers J.J. Harris and McKellan Lee was capped off on a one-yard dive by Harris and the extra point was good off of the foot of Chillicothe’s kicker to tie the game at seven with 8:53 left in the first quarter. 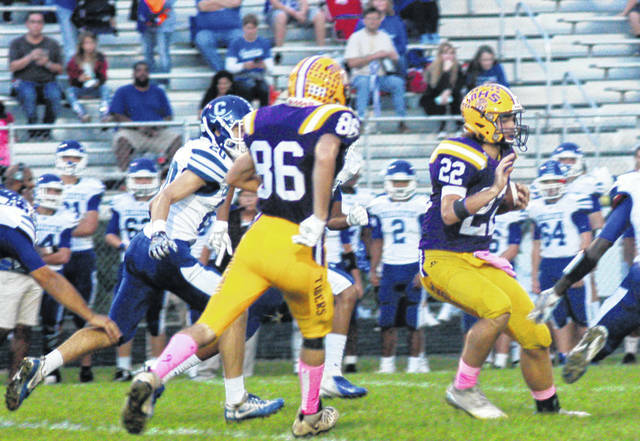 A three and out was common sight for the Tigers on the night as they were unable to crack the Cavaliers’ defense for the rest of the game. On the other hand the Cavaliers were able to control the game on the ground with an assortment of running backs including Harris and Lee. Chillicothe was able to convert on five consecutive drives in the first half to take a 34-7 lead. Even when Chillicothe did make a mistake and had to punt to the Tigers the Cavaliers defense held and then blocked the ensuing Tigers’ punt then recovering the ball at the one yard line to set up a one yard Braeden Jones touchdown and a 41-7 lead for Chillicothe. Chillicothe went right back to business following halftime as they scored two touchdowns in under five minutes with the clock running to put it out of reach for the Tigers at 55-7. The final score of the game for Chillicothe came with seven minutes to play and saw Chillicothe reserves punch it in from seven yards out and then a fumble on the snap for the point after was recovered by Jones and taken to the end zone for the two-point conversion. The Tigers fall to 1-1 in the FAC with the loss and are now 2-5 on the season. Chillicohe improves to 2-0 in the FAC and 5-2 overall on the year.